A rather later "Morning Gooners" than usual. I bet there are a few sore heads amongst the Gooner community this morning and so there should be... I'm certainly one of them. It's not every day you beat Chelsea 5-3 in their own back yard. I think yesterday's game was the most entertaining match I've seen this season and in my opinion the result was down to all 11 Arsenal players giving 100% for 90 minutes. I wonder whether Bruce Buck's comments were posted on the door of the Arsenal dressing room for each player to see as they walked out on to the Stamford Bridge pitch because that would have provided the all the motivation the Gunners needed to beat this class-less team. It was fair to say we had some luck. I think had Wojciech Szczesny been sent off in the opening period of the second half the game would have been totally different. Fortunately for us he wasn't and with both sides having 11 players on the pitch, we showed we were easily capable of getting a result in south west London. However we didn't start well and were lucky to get let off the hook early on. Laurent Koscielny getting back in time to intercept an Ashley Cole cross before it reached Fernando Torres, after the former Arsenal man beat Johan Djourou for pace and tactical awareness down our right. Daniel Sturridge was the next to breach our back line this time down the left as he raced in on goal. Had he sent an early ball into the box Torres would have had a free shot but Koscielny recovered to prevent the angle and Sturridge's ball was prevented from reaching the Spain international by an out-stretched Szczesny. After that Arsenal kicked into gear and should have been ahead but for an awful finish from Gervinho. The excellent Aaron Ramsey worked a ball with Mikel Arteta to set Theo Walcott free on the right. He pushed the ball over Cole to race onto it, getting to the byline and producing a pin-point cross for the Ivorian. All Gervinho had to do was place his shot inside the posts. He was unmarked but he fluffed his chance and set the ball wide of Petr Cech's right hand post. 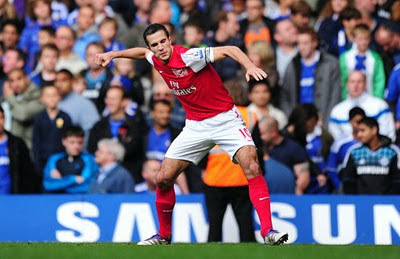 Moments later Robin van Persie had a chance to put his team ahead. Walcott again the provider. His back post cross found the Arsenal captain in a glorious position, but the Dutchman couldn't find the target. Would Arsenal be left to rue their chances? Thankfully not. However we did concede the first goal of the game. And it would come from a cross from a player we wanted to sign in the summer. Juan Mata was given a yard of space on the right by Andre Santos to fight in a perfect cross for Frank Lampard. The ball could have been cut out by Per Mertesacker had be bothered to jump for it, but ended up finding Fat Frank's head and the ball found the bottom left hand corner of the Arsenal goal. A very disappointing goal to concede and questions have to be asked of Mertesacker, who should have done better in cutting out the cross. For such a tall man he doesn't inspire confidence that he'll win the balls in the air you would expect him to. Chelsea could have doubled their lead as Sturridge again raced through on the left. He was baring down on Szczesny's goal with ease but didn't create the perfect angle for a shot fortunately and the ball went wide of the Poland international's goal. It was the home side who were left to rue their missed chances as Robin van Persie put Arsenal back on level terms after 36 minutes. Ramsey played a ball which cut through the heart of the Chelsea defence and found Gervinho, who was being played onside by Cole. The Ivorian could have taken the opportunity himself but squared the ball for the Dutchman to slot home. We were fortunate not to be behind within minutes of our goal, with an eagle eyed linesman to thank for chalking off Ramires' goal after Sturridge again got the better of Santos. Cue Szczesny's double fist pump in front of the home fans because of the linesman's decision. However we didn't go into the break with the scores even. In injury time at the end of the first half, Ramsey conceded a corner. Fat Frank took the kick and found his mate John Terry in the centre. Mertesacker again didn't deal with the ball and the England captain found the back of the net. Again the German was awful. There was no way Terry should have been allowed anywhere near that ball but because of Mertesacker being out muscled in the challenge, all the Chelsea captain had to do was guide the ball into the goal. So behind at the break but we came out the stronger in the opening periods of the second half. We might have been level within a minute of the restart. Ramsey getting into an excellent position in the box but his shot went over the bar rather than into Cech's net. However it didn't take long for the home side's goal to be breached. Alex Song found Santos in acres of space on the left. The Brazilian attacked the goal and let go a venomous shot which sped through Cech's legs and into the goal. 2-2 and still we had 41 minutes left to play. How this game would finish would be anyone's guess but I thought from watching the first half the home team were there for the taking. All Arsenal needed to do was take the chances they created. Then arguably came the moment which could be regarded as the turning point in the afternoon. Cole was set clear down the right. Szczesny did an "Almunia" - flew out of his goal and clattered the England left back bringing him to the floor. Koscielny was level with Cole, so that is probably why referee Andre Marriner didn't send off the Gunners keeper instead booking him and awarding the home team a free kick. The first half had shown that if Arsene Wenger's team were determined enough, they would get a result from this game and so it proved. Theo Walcott had that spirit as he picked up the ball on the right. He drove at the Chelsea defence and was impeded by several defenders who stopped dead in their tracks as they expected Marriner to blow up for a free kick. However he didn't and instead Walcott was able to get to his feet, push the ball past two defender and shoot hard and low inside Cech's near post. A goal which was made by Theo and just goes to show that he can do it... although he needs to find consistency in his performances. The Gunners 3-2 up but with 35 minutes left to play. Neither defence had looked at their best but the home team hadn't been creating the chances in the second period which had left the Gunners defence worrying about every wave of Chelsea's attack. Neither side created that many opportunities before Wenger reshuffled his pack. Sending on Carl Jenkinson for Johan Djourou and Tomas Rosicky for Theo Walcott. These types of chances can work against Arsenal and so it proved. Within minutes of them being made, the home team were back on level terms. Romelu Lukaku, who had come on for Ramires, blocked off Santos as he went to close the ball down. It could well have been deemed a free kick but the referee didn't and so the home side played on. Mata let fire from outside the box. Song got a last gasp tackle in but only for it to add a further deflection to the ball which rocketed beyond Szczesny. At 3-3 many could see it ending like that. But not Robin van Persie. Malouda putting Terry under pressure with a poor back pass - the Chelsea captain slipping - allowing van Persie through on goal. The Arsenal man rounded Cech and shot home putting the Gunners 4-3 up. And to top it off, the Gunners captain rounded off the afternoon with a hattrick in the 90th minute - with the goal of the game. A pile driver which beat Cech again at his near post. It ended 5-3 to Arsenal and I don't think it's any less than we deserved. I though that van Persie was superb - scoring only his second ever Arsenal hattrick - and Aaron Ramsey had a fantastic game. Laurent Koscielny at the back also continues in his fine run of form. But the player who kept us ticking was Mikel Arteta. He's had a slow but reasuring start to his Arsenal career but he really showed his worth today. An excellent range of passing and all action display from midfield which showed why Wenger went for him. He was great alongside Alex Song, providing our back four with the cover it needed. A word also for Theo Walcott. I've been a big critic of the England man. I think he could be an excellent player for us but he lack consistency. However yesterday he was on top form and he created the third goal all by himself. So credit where it's due. "We knew that we needed a win here and we kept going to win the game. Overall I feel that they had a good team performance and they have shown great spirit. "When you go 2-1 down just before half time it's difficult but we came out in the second half with a complete desire to go forward. "In the second half I felt we were much better defensively than in the first half. We gave too many chances away in the first half - it's certainly down to the fact that Chelsea have a lot going forward. "But we always looked dangerous through the whole game and I hope the team strengthens its belief with a performance like that to focus on getting stronger and stronger." We're up to seventh in the league now and the result yesterday must boost our confidence. It could well prove the difference in our league campaign this season. We've now achieved nine wins in our last ten fixtures and RVP is on fire with 28 goals in 29 Premier League games in 2011. I don't think anyone expect us to win the league, but if these results can build confidence for our cup campaigns, then all the better. And talking of the cup, we were drawn against Manchester City in the last eight of the Carling Cup yesterday. A tough fixture which will be played at the Grove the week of November 28.